Fresh pasta parcels, made in Italy filled with sweet butternut squash and Mediterranean herbs. Made with natural ingredients. 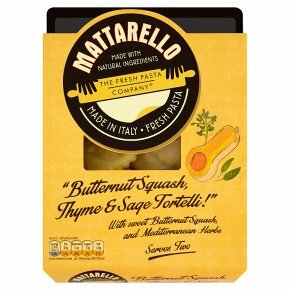 With sweet butternut squash and mediterranean herbs. Made in Italy. Fresh pasta. Ready in under 10 minutes1. Boil 1 litre of salted water per 100g of pasta.2. Add 125g per person and return to gentle boil. Simmer for 4 minutes. (no need to separate, pasta parcels separate naturally during cooking).3. Drain, toss with melted butter and serve immediately. Sprinkle with Parmesan cheese.